Yesterday I was browsing through some of Maya's older posts over at Completely Coastal and came across Beaches That Rock from a few months ago with pictures of some of the amazing rock formations found at various coastlines around the world. They were all beautiful, but the two from California made me homesick. For today's Outdoor Wednesday post I thought I would get away from Florida for a little while and take you on a walk outside my son's home in Redondo Beach, California. Then we'll take a drive up the coast for a quick look at some of the scenery on the West Coast. Ready? Got your camera with you? Okay, let's go! 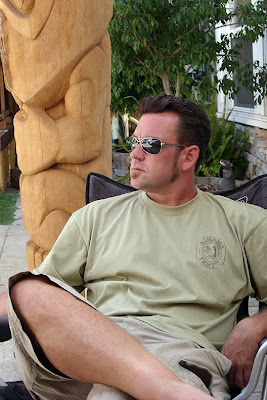 My son, Jim — artist, photographer, tiki carver and all-around talented guy. He's the one who got me started in graphic design and is my biggest supporter. He's pictured here in his backyard in front of one of his tikis. Before we go lets take a peek in his backyard. Tucked away in the corner is one of his tiki bars. 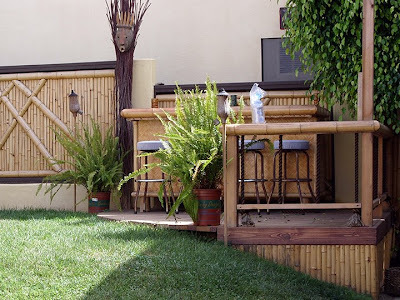 He built the deck, the bar and even the bamboo fence. Pretty cool, huh? At the other end of the fence is another tiki bar. I should tell you that his place is infamous for the parties that are held here throughout the year. They have a Hawaiian luau coming up soon, but they are using a backdrop of a desert scene that will cover the front of the house completely. Luau in the desert? Come on, you know how these artist types are! 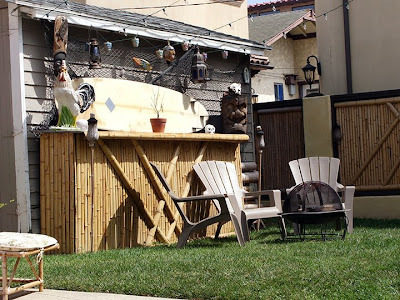 I mean who else puts a chicken on a tiki bar? Anyway, walking down to the beach you can see that Jim is approaching some of the beautiful SoCal tide pools. Just look at this sea and sky, just melts any stress you're feeling. 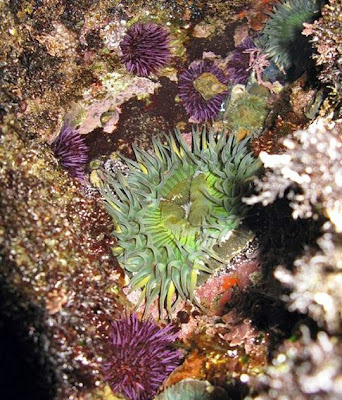 Tide pools are like gardens of the sea. 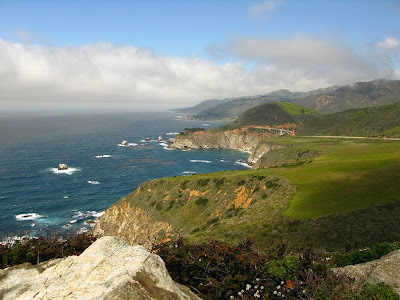 Now lets jump in the car and head up north for some breathtaking views of the California coastline. I call this Pelican Rock. 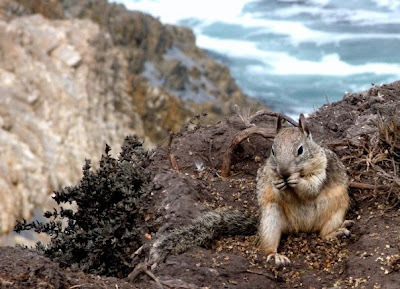 Even squirrels enjoy living at the beach! This little guy looks so relaxed and peaceful. Lets leave before we disturb him. I hope you enjoyed your trip to California today. Now go quietly over to Susan's at A Southern Daydreamer for more Outdoor Wednesday posts. 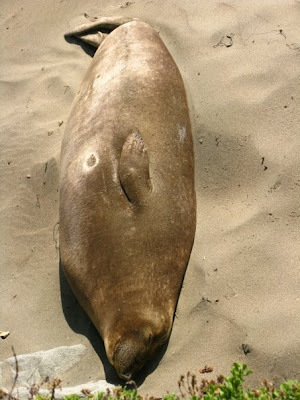 Shhhhhhh……………seal sleeping. I love checking your blog when I should be working. You take me away just for a few minutes and I don't even have to leave my desk. The pictures are fabulous like always. It would be amazing to see all those seals. I think they are very cute. Rhonda... 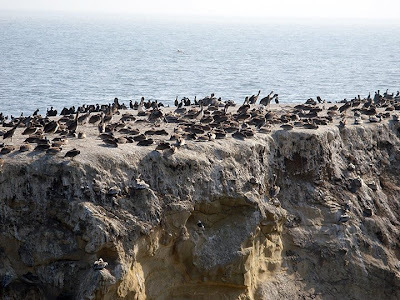 I'm just fascinated with the California Coast and all of the varying wildlife there! 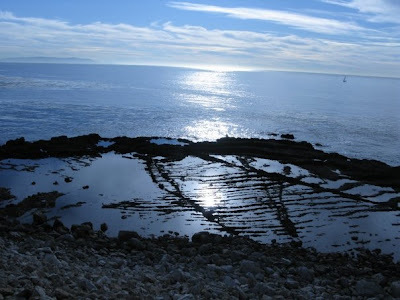 And those tidal pools are BEAUTIFUL. WOW! And your son's yard and art are lots of fun! I would love to be a fly on the wall for his party! LOL! I love what your son does..., my husband actually has a degree in sculpture, similar... although he never did wood carving. The tiki bar looks fantastic. Imagine having that in the backyard..., well he does! And the coast..., I just really want to drive up and down the Northern CA coastline again..., and thanks so very much Rhonda, you rock!!! Hi Rhonda! What a great post! First of all, your son is so handsome and so talented too! 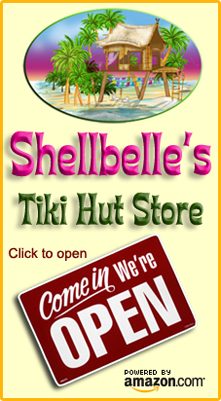 I see that Rooster on his tiki bar! That is a hoot! 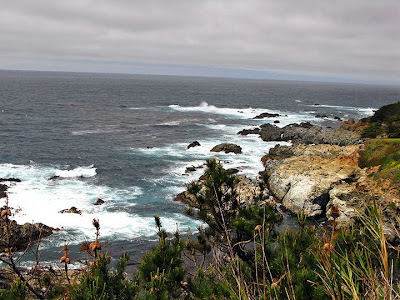 Oh, I've been to Big Sur a few times and you've brought back some lovely memories for me! 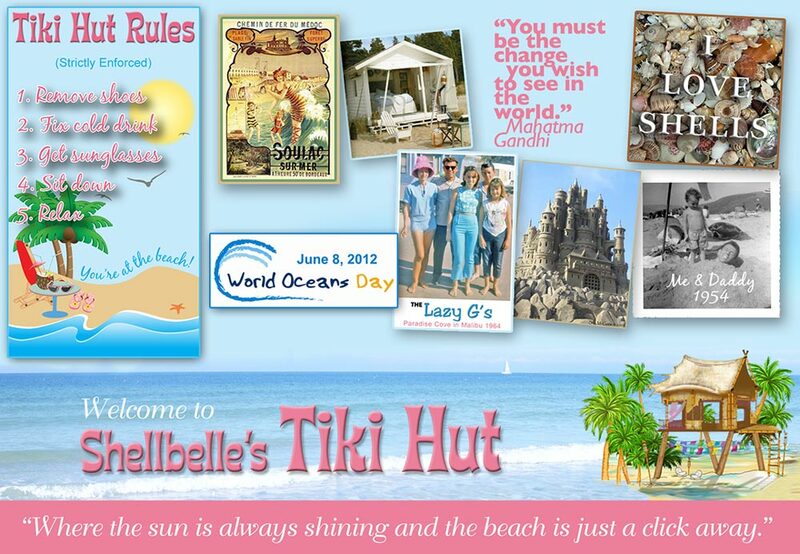 Thank you for sharing such great pics! Your son is very talented (and handsome, too!). His backyard looks great! I'm whispering so as to not wake the little guy. The California coast is breathtaking isn't it and I have not seen it all yet. 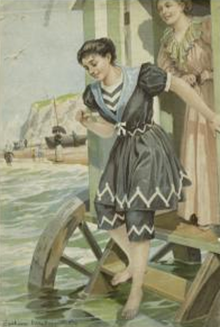 I have seen the squirrels at the beach though, your son is very talented, what a lovely place he has there. happy Wednesday, Kathy. Oh my goodness, what gorgeous photos! We've been to So Cal only a couple of times and the coast is awe inspiring. 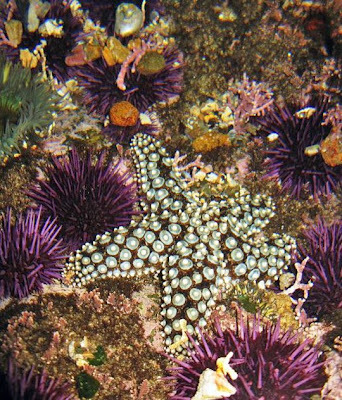 The tide pool photos are gorgeous. Rhonda! Your pics are incredible! What beautiful scenery! Southern California looks heavenly! Thanks for sharing... oh and thanks for visiting my blog! Loved the cybertour. Your photos are lovely. Thanks so much for sharing them with us. Enjoyed the tour. Nice looking son. Maybe I should have been a seal then no one would think all my blubber was a bad thing. I think being a bear is better, though. Seriously,the pics of the beach had me swooning!Most excellent! This is a great post. When you first mentioned your son, I though he took after you. Then you mentioned he encouraged you to go into graphic designs. How great is that! He did a wonderful job on the deck and bar. I have never been to California. Thanks for letting me go there through your blog. The scenes of the shore and tidal pools were beautiful. 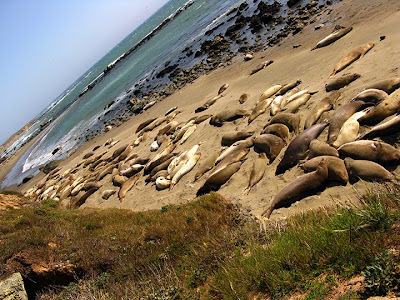 I didn't know you would see so many elephant seals together like that. Just found your lovely blog! 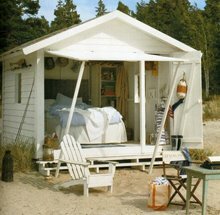 I love the sea and the beach..
we have to drive for a few hours before we get there, so that's not very often...too bad!!!! I won't wake up the seal, promise! Aww, I always love coming to your blog. I get some ocean dreaming in daily. 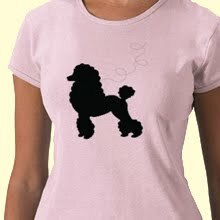 ;) Your son is super talented - how cool to have tiki everywhere!! Fantastic snaps. Especially California coastline. I stopped by yesterday to say hello, but blogger didn't leave you my message so here it is again my dear. So hello again. Love, love the pic of the seal. Such utter contentment on his face. Thank you for that serene drive along the Coast. It's been awhile since I last took a convertible, threw on a pair of oversized sunglasses and wound a flowing scarf around my neck and pretended I was Grace Kelly or Audrey Hepburn with every passing breeze from the sea. It was wonderful, reading it all. Great post. I enjoyed seeing the sleeping seal the most. Just wonderful. I do love our CA beaches. 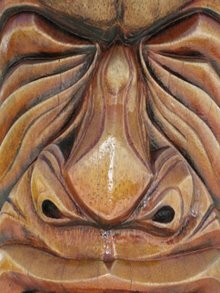 Your son is very talented with those tiki carvings!! Hola! Just peeking throug hyour blog and I ended up here. Your son sure is talented with those tikis wow! I do love all of these pics, i have the same big sur pic framed in my apt. 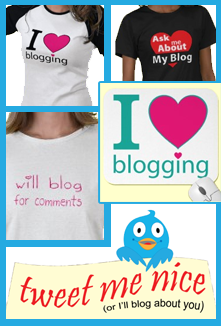 thanks for visiitng my little blogeroo, I am slowly startting to catch up with all of my friends from the blogosphere. happy sunday!